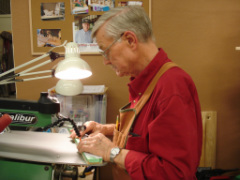 My wife Karen and I are pleased to have the opportunity to present workshops in Scroll Saw and Mini-Wood Lathe,and to share the techniques needed to make these wooden creations. Please browse our website, and contact us if you have any questions. We would love to see you in one of our workshops or classes. Have fun learning something new! It is my privilege to have been asked to present these workshops, and to share this information with others wherever possible. To be able to give these workshops and present the techniques, skills, and extra tricks that make them rewarding and worth doing, it has taken much learning from a great mentor, and many other people along the way. It has also taken a lot of time and practice to achieve these skills, plus many great lessons taught by the "School of Hard Knocks". For those of you that may be interested, you may click on the button at the bottom of this page and you will have the opportunity to read the complete story of that 24 year journey.